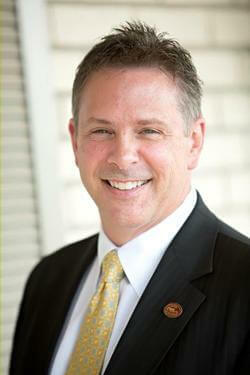 Since 1906, Cooper Funeral Home has been serving the community by helping families in their time of grief. It was in 1906 that J. M. and Cordelia Cooper bought their first stock of funiture, which included several caskets. That began a long history of providing personalized funerals for people in their community. And today, more than ever, Cooper Funeral Home continues to carry on their mission to provide one-of-a-kind experiences for their families to help them honor the life of their loved one and bring hope and healing in their time of grief. Click on the links below to see how Cooper Funeral Home continues its legacy of caring, compassionate service to the people in their community. J. M. and Cordelia Cooper bought their first stock of furniture which contained a few caskets. This indirectly led to their combined furniture and undertaking business. For many years, Cooper Funeral Home has been the ultimate provider of creative healing experiences, serving families in the local community. This section contains the heritage, vision, and the people behind Cooper Funeral Home's reputation of quality, sincerity, and trust. We have over a century of experience caring for families, from all walks of life. Each family comes to us because they know we are leaders in our profession, dedicated to excellence in service, and have the highest integrity. 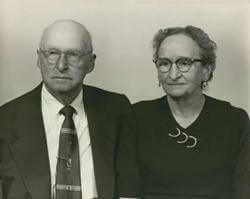 James McDonald “Jim” Cooper with his wife Cordelia “Delia,” founder of the Cooper Funeral Home, traveled to Tecumseh in 1903 from Natural Dam, Arkansas, in a covered wagon pulled by a couple of mules. He began working for his father-in-law, H. J. Boyd, as a delivery boy in his grocery store while his wife cared for her four brothers after her mother’s death. In November of 1904 he bought a confectionery store where he sold candy, milkshakes, popcorn, and roasted peanuts. In June of 1905 he sold the confectionery store and bought a candy floss machine that came all the way from Bloomfield, New Jersey, for the grand sum of $175. In December of 1906 he sold his candy machine and bought the first of several furniture stocks, one of which contained a few caskets that indirectly led him into the funeral business. He continued the combined furniture and undertaking business, and in 1924 he bought an old Cadillac hearse and in 1926 an ambulance. 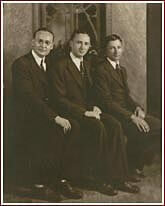 Following Jim's retirement in 1946, his sons, Virgil, born in 1905, J. Lynn, born in 1915 and H. J., born in 1918, continued to operate the family firm until 1952. At that time, H. J. sold his interest in the business and moved to Tulare, California. Then in 1957, Virgil and J. Lynn decided to move the furniture store away from the undertaking business. At that time, J. Lynn became the sole owner and operator of the funeral home while Virgil operated the furniture store. In the meantime, Jim L. Cooper, Lynn's son, obtained his degree in Business Administration from Oklahoma University and completed his professional training at the Dallas Institute of Mortuary Science. In August of 1964 he returned to Tecumseh and joined his father in the family firm. The funeral home was moved from its downtown location of fifty years to its more spacious site on West Walnut Street in 1976. Upon Lynn's retirement in 1984, Jim then became the owner of the business. After obtaining his degree in Business Administration from Oklahoma University and professional training at the Dallas Institute of Mortuary Science, J. Cooper, the fourth generation of "Coopers," joined his father in March of 1990. 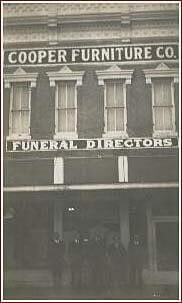 In September 2006, Cooper Funeral Home celebrated its centennial anniversary. A monumental point in the family's history, the celebration was shared with the staff and the community. Upon Jim's retirement in 2013, J. has taken over as owner of the business. The world has changed dramatically since 1906. Like you, they have celebrated with the world in moments of great joy. And, they have mourned the tragedies. Through it all, they have held on to the tradition of loyal service to the families they serve. It has been the philosophy of the firm to serve every family with respect, dignity, compassion and concern. As they embark upon their next 100 years, it is their goal to continue their tradition of providing the highest level of service to those families who have placed their trust in Cooper Funeral Home.